Our primary goal is to spread love - so when the community calls, we answer! With your support (and donations) we were able to deliver car loads of items to families in need. 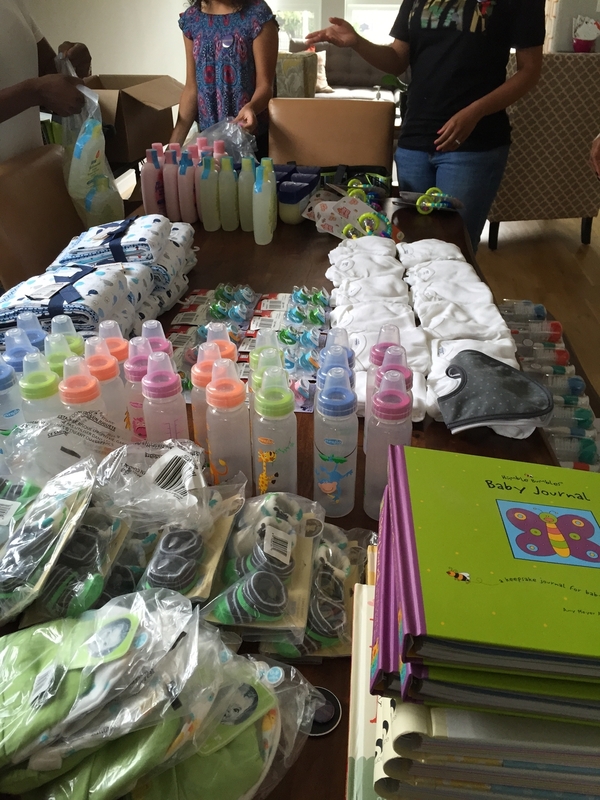 On August 28th, we hosted our first citywide group baby shower. We were honored to host 5 families as they welcomed their new bundles of joy. Because of your support, we were able to provide key essentials, family portraits, catered lunch (and some extra love) to these families and babies! Giving Tuesday is the perfect opportunity for you to support your favorite organizations, charities, or groups of people who are making efforts to create a better world. Whether it’s supporting The Perfect Cadence’s initiatives here or another organization’s mission, find a cause that means something to you and spread love! Saturday, March 31st, meet us at En Las Tablas Performing Arts (4111 N. Armitage Ave) for the Because, Love... pop-up shop. 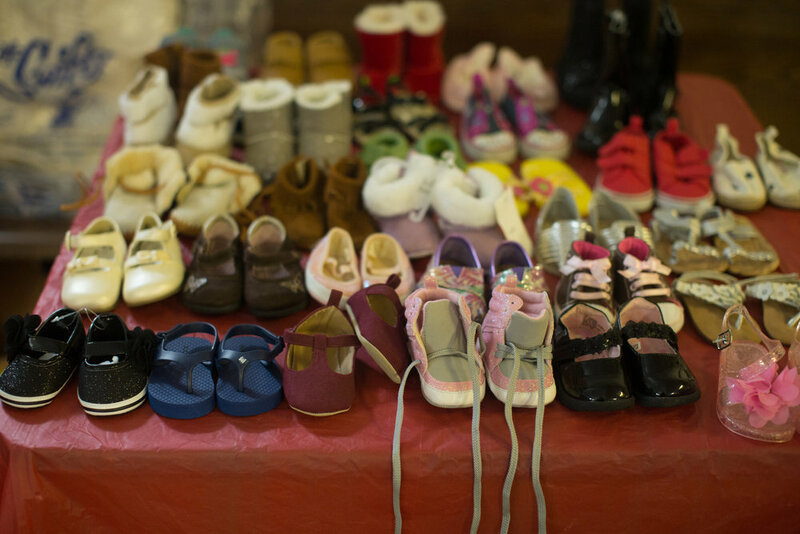 We will have baby clothing, shoes, furniture, and accessories available for FREE! The event starts at noon and will go until 3pm. Rhythm & Brews Was a Success - THANK YOU! The Perfect Cadence would like to thank all of our sponsors, donors, volunteers, and guests. Our 3rd fundraiser as a success and we couldn't have done any of it without you. Check out a few pictures from the evening and stay tuned for information on our next event! Rhythm & Brews III - Monday, October 9th! Our 3rd annual Rhythm & Brews fundraiser is fast-approaching and we're super excited! On Monday, October 9th, we'll be back at Vice District Brewing Co. for great food, great beer, and great vibes. All proceeds from this event allow us to continue our mission of showering those in need with the love and support they deserve. Our 2nd Group Shower with New Moms, Inc.
On Thursday, September 14th, The Perfect Cadence had the opportunity (and the pleasure) to host several moms as they wrapped up their prenatal classes with New Moms, Inc. We, along with our friends from Mama Fresh Chicago and The Mommy Break Project, showered these awesome parents-to-be with some new baby essentials, gift cards so they could purchase a few things once baby comes, and cake (because what's a baby shower without cake?!). Our 3rd "Because, Love..." Free Pop-up Shop! We're thrilled to share some photos from our 3rd Because, Love... pop-up shop! Thanks to Messiah St. Bartholomew Episcopal Church for hosting us, thanks to everyone who volunteered and helped us help so many others, and a huge thanks to everyone who donated items and helped spread the word about the event! We wouldn't be able to do any of this without you. We're excited to announce that our TPC logo tee is now available for purchase! You can get yours here. All proceeds go towards our continued efforts to support new moms and babies! We've been off doing a little planning for 2017 and we're excited about what's to come! We'll be hosting our first shower of the year in March. If you or someone you know is expecting and in need of a shower, please submit an application any time between now and February 10th. We will select and notify the shower recipient by February 17th. Rhythm and Brews II Was A Success - Thank You! Our 2nd Rhythm and Brews fundraiser was a success and we appreciate you for helping to make that happen. We would like to thank every sponsor, every donor, and everyone who found a way to support The Perfect Cadence. We thank you. We appreciate you. We look forward to an exciting 2017. Join The Perfect Cadence Monday, September 26th from 5:30pm-8:30pm for our 2nd Rhythm and Brews fundraiser. We will be at Vice District Brewing (1454 S. Michigan Ave.) with great food, great music, great raffle prizes (details coming soon), great people, and great vibes - all for a great cause! Tickets to this year's fundraiser can be purchased here. A portion of each ticket will be tax deductible. "Because, Love..." Pop-Up Shop #2! We're excited to announce our 2nd "Because, Love..." pop-up shop! This time around we'll be at En Las Tablas Performing Arts in the Hermosa neighborhood. Come by and "shop' for free, Saturday, August 27th from 10a-1p. We'll see you there! A year ago today we launched The Perfect Cadence. Thanks to your help and support, we have been able to accomplish so much this year! We have thrown baby showers for seven new moms, hosted a free pop up shop where moms came and "shopped" for awesome baby items, and we have gifted over 10 moms with new baby welcome kits and other new baby essentials. We also welcomed Cadence's little brother last year and we are witnessing first hand the joy he brings to the world. Indeed, it has been a full (and fulfilling!) year. We couldn't let the day go by without saying thank you! Click here to read the full letter from Cadence's mom. Group shower with New Moms, Inc.
We had the pleasure of collaborating with New Moms, Inc. to host our first group shower. TPC and our team of volunteers had the opportunity to hang out with 4 awesome expecting moms and shower them, and their babies, with a little love. Thanks to University Church for hosting us and our "Because, Love..." Pop-up Shop on Saturday, May 21st. We had such an amazing time with everything. Thanks to our volunteers, those that donated, those that shared the posts and help to spread the word, and to those who were able to come find some things they needed! Stay tuned for information on our next pop-up shop. Saturday, May 21st, The Perfect Cadence will be at University Church (5655 S. University Ave) hosting our first "Because, Love..." Pop-up Shop. From noon-4p, families in need will be able to select from gently used baby items that have been donated to TPC - for free! A BIG thank you to the students, parents, teachers, and staff of Songbird Academy for donating these Welcome Baby Baskets! With these donations, we were able to bless several new moms with some key essentials for welcoming their new bundles of joy into the world! Thanks so much to Hope Cafe for hosting us this weekend for our second TPC baby shower. 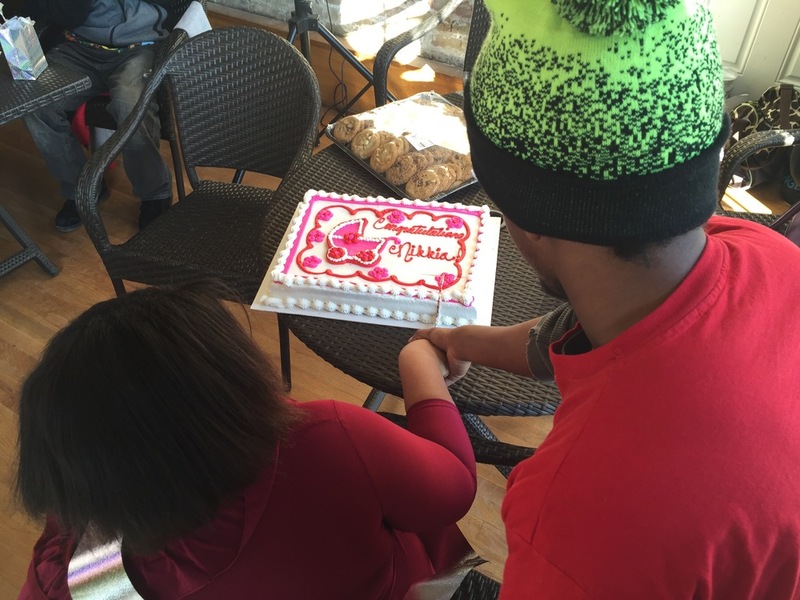 We had a great time celebrating Nikkia's soon-to-be-born baby girl! You can check out more pictures from this shower on our events page. Our first hosted TPC Baby Shower! the joy he brings to the world. Indeed, it has been a full (and fulfilling!) yearGreat times at our first TPC baby shower. The celebration of life was held at the Gladys Fox Museum in Lockport, IL. and was all about showering mom, dad, and soon-to-arrive baby boy with as much love as possible. Our first fundraiser, Rhythm & Brews, at Vice District Brewing Co. Thanks to the beautiful people at Vice District Brewing Co. for hosting us for our first fundraiser. It was a great night full of fun, fellowship, and amazing support. the joy he brings to the world. Indeed, it has been a full (and fulfilling!) yearOur Cadence Day service project was awesome! The TPC team assembled 10 Welcome Home Baby Kits for the Night Ministry's new mom program. Scouting the location for our dedication tree! Out in Lincoln Park searching for the perfect location for planting our dedication tree.